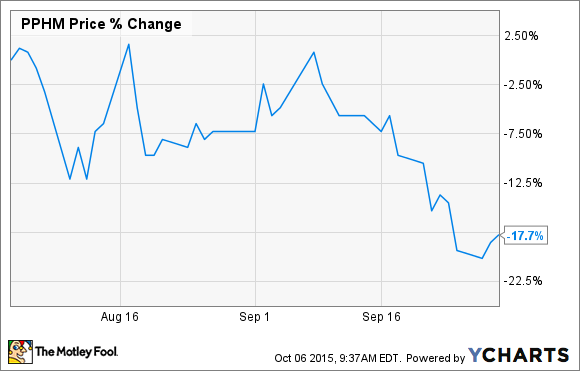 Peregrine Pharmaceuticals' stock had a rough September. Should investors take advantage of this pullback to add this speculative biopharma to their portfolios? What: Peregrine Pharmaceuticals (NASDAQ:PPHM), a clinical-stage biopharma specializing in the development of monoclonal antibodies to treat cancer, saw its shares slip by almost 18% in September based on data from S&P Capital IQ. The good news is that this sell-off wasn't triggered by a specific negative regulatory or clinical catalyst. Now what: While Peregrine's contract manufacturing subsidiary Avid Bioservices reportedly has a $42 million backlog in existing customers, Wall Street thinks the company's ongoing late-stage study for bavituximab, as a second-line non-small cell lung cancer treatment, will widen the company's net loss per share by another 23% next year. As this event-driven pivotal trial may not produce top-line results until the end of 2016 or early 2017, Peregrine clearly has a long road ahead of it before reaching the promised land of an approved market. As such, investors may want to hold off on buying this small-cap drugmaker's shares for the time being.